Paul Weller At The Albert Hall – Friday Set List! – Paul Weller News! Paul Weller At The Albert Hall – Friday Set List! IF the mark of a great performer is how well he copes in adversity, then The Modfather really is a legend. Recent albums Wake Up The Nation and 22 Dreams are among his best, but even mighty Paul struggles against the venue’s dodgy sound – his string section is inaudible. It doesn’t help that the first half features few classics – only recent angry hit From The Floorboards Up and riotous new song Trees rise above the muddy noise to hit home. Then, just when it looks like a bad night at the office, the music gets more furious as Weller and his superb band virtually set fire to their remaining songs, including The Jam smashes Pretty Green and Start. Weller is reborn, finding room for beautiful solo hit Broken Stones among the chaos. The lesson is, never mess with an old Mod. Previous Entry Paul Weller At The Albert Hall – Thursday Set List! 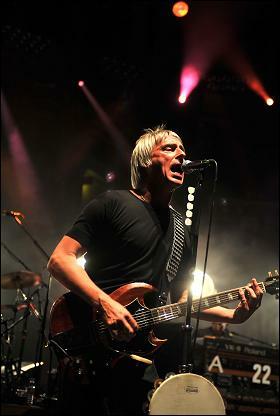 Next Entry Paul Weller At The Albert Hall – Pics From Monday Night!